Sheikh Nahyan bin Mubarak Al Nahyan, Minister of Tolerance, won the Educational Personality of the Year at the Khalifa Award for Education. He was recognised for his tireless efforts in promoting education and supporting learning activities across the UAE. 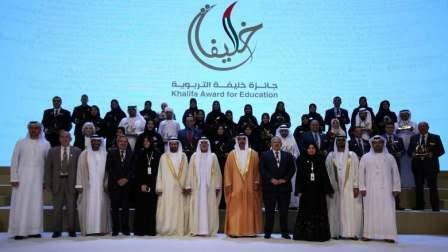 Sheikh Hamed bin Zayed Al Nahyan, chief of the Abu Dhabi Crown Prince's Court and member of the Abu Dhabi Executive Council, honoured the winners of the Khalifa Award for Education 2017/2018 at a ceremony held at the Emirates Palace Hotel in Abu Dhabi on Monday. This cycle of the awards included 39 winners, comprising of those from the UAE and the Arab region. Hussein Al Hammad, Minister of Education, said at the award's mission, supported by the President, Sheikh Khalifa bin Zayed Al Nahyan, is to be a leading national initiative to encourage people, who work in education, to innovate and develop education, in compliance with the challenges of the information age. "Education has been so pivotal in the growth and development of the UAE and the nation's leaders are keen in supporting the education sector for quality learning," said Al Hammadi. On receiving the award, Sheikh Nahyan said: "I am very proud to be selected for this coveted award, which is named after the President, Sheikh Khalifa bin Zayed Al Nahyan." Affaf Tobbala, 77, professor of mass communications at the Modern Sciences and Arts University in Egypt, won an award for her work on children's literature including a book for young innovators. "I am happy that my work about authoring books for educating children has been recognised." Tobbala, who is also an editor, scriptwriter and art producer of a number of short documentaries and films, was recognised in the category of distinguished university professor in the field of scientific research. Fatimah Saeed, 35, a kindergarten teacher at Al Woorod School in Ras Al Khaimah was recognised for her creativity in the classroom. "I am keen on doing research about the best and latest teaching methods and this helps me to develop good teaching skills and create good teaching materials for my pupils," Saeed told Khaleej Times, aft-er getting her award. "I love teaching small children and this award is a big honour for me. It will motivate me into doing more for the excellence of children." Saeed has represented the UAE in various international educational workshops. She said she is looking forward to presenting her suggestion to authorities about creating a ministry for children's affairs. Moza Mohammed, 35-year-old teacher at Hala School in Fujairah, received the award for her tireless work on Islamic strategic and creative projects. "I am so happy to receive this award. My research and creative projects in the religious field have helped improve children's learning because they can easily get the concepts." Among the award categories included; educational innovation, promising teacher, distinguished university professor in the field of teaching, distinguished university professor in the field of scientific research, creative teacher, special needs, creativity in teaching Arabic and others.